As a landscape photographer the opportunity to photograph portraits seldom came my way since concentrating on Formula 1 Grand Prix drivers of the 1960’s when commissioned by Agfa Gevaert. However, photographing creative people working in their chosen landscape and environment was a subject I had often considered. Somewhat surprisingly, on a Sunday morning in the summer of 1981 I found myself traveling the short distance north of Wimborne where I lived, towards Higher Gaunts near Stanbridge and the Old Keeper’s Cottage home of Sven Berlin and his wife Julia. Roger Holman and I had been asked by William (Bill) Hoade, then owner of an antiquarian bookshop in Wimborne’s West Street to photograph Sven at work together with some portraits for a forthcoming exhibition in Cornwall’s famous artistic centre of St Ives. 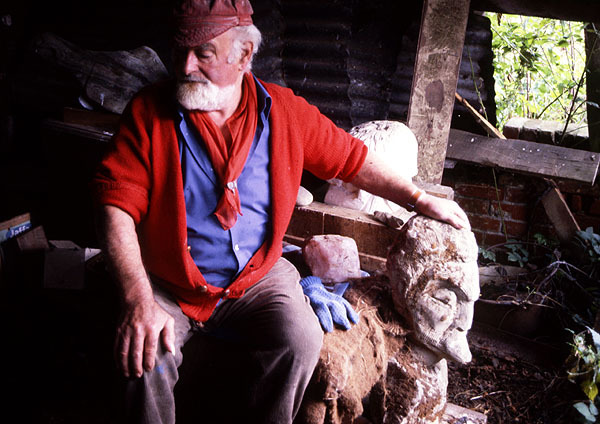 Roger Holman concentrated on Sven at work on a swan sculpture while I concentrated on portraits of Sven the artist and creator. We were welcomed by this gentle giant of a man who I had never met before but had frequently seen standing out from the crowd around Wimborne. 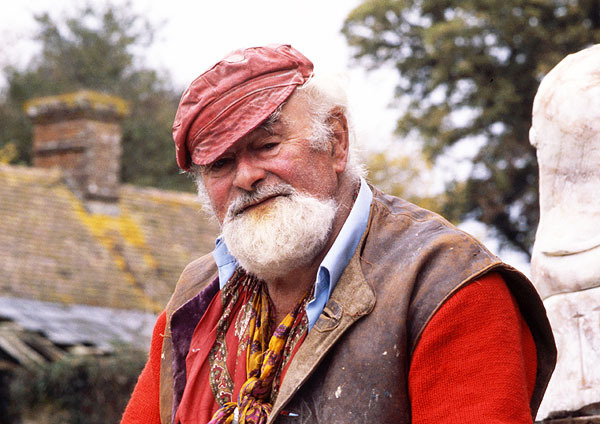 Dressed in his familiar style with a flash of red, the distinctive white beard and ruddy complexion protruding from the ever present bargee style cap, Sven looked every part the artist he was. In his quietly spoken and gentlemanly manner he showed us around his studio and his work, some completed and some ‘in progress’ and it was in a somewhat tumbledown low roofed barn that I came across an interesting piece of work amid remnants of stone and other seemingly discarded works of art. This was unquestionably a self -portrait in stone. Expressing my interest in a photograph with this sculpture, Sven immediately obliged and sat beside it, holding his head in such a manner as to render his familiar profile as a mirror image. As a photographer always looking for a picture I endeavoured to read Sven rather like a landscape. To me, his face was full of reflection and contemplation, like someone always remembering the past yet aspiring towards a greater future. Indeed, most artists and photographers will say their next piece of work will be their greatest. Perhaps Sven should have been more recognised than he was but I don’t think he ever strove for stardom, he seemed to me quite content with his work and environment, an artist who was true to himself. He was certainly much respected with many successful exhibitions and much of his work still remains in private collections. Much has been written of Sven’s life and it is not my intention here to elaborate further, preferring to leave such detail to those more qualified to do so, but perhaps a short recollection of how this artist came to Wimborne would be appropriate. Born in Sydenham, London in 1911 he was the son of a Swedish timber and paper merchant and had already started painting by the age of 12. At 19 he had become a dancer and toured the variety halls of England until his continued interest in painting found him entering the Camborne-Redruth School of Art at the age of 28. After his time in the war he returned to Cornwall and became established in the creative scene of the time with the St Ives artists Barbara Hepworth, Ben Nicholson and others. In 1953 Sven left St Ives and travelled in a horse drawn Romany wagon via Dorset to the New Forest and lived there until 1970. 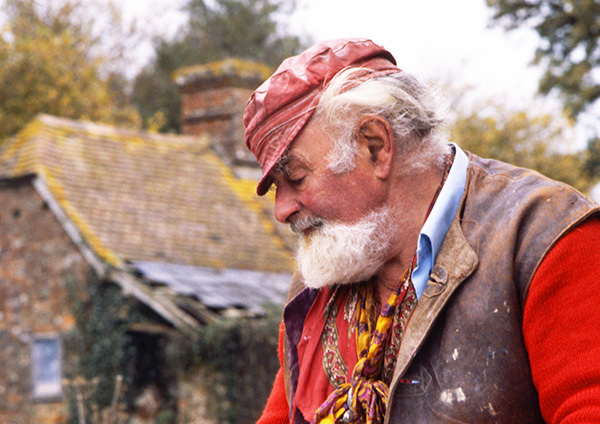 During his time in the New Forest he continued with his painting, writing and sculpture and became the subject of a number of television documentaries. Here he married Julia, his third wife and after a few years on the Isle of Wight they moved to Higher Gaunts near Wimborne in 1975. 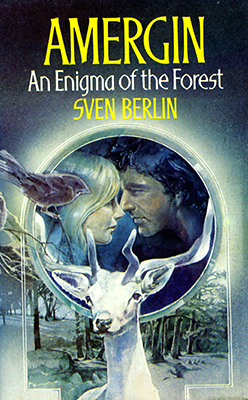 It was at Gaunts that Sven wrote his first and I believe only novel in 1976 ‘Amergin’ – An Enigma of the Forest. It is the story of a white stag and two people living with the forces of nature and the forest environment. A quite deep and thought provoking tale that could only have been written by someone with an intimate experience of life in the forest and an observer of the natural world; Sven was certainly that. As we said our farewells Sven produced a copy of Amergin and signed it with his very distinctive signature. Once again photography had provided me with an interesting subject for the camera and in this case a portrait rather than a landscape. I hope I portrayed Sven well, his life is certainly written in his face. 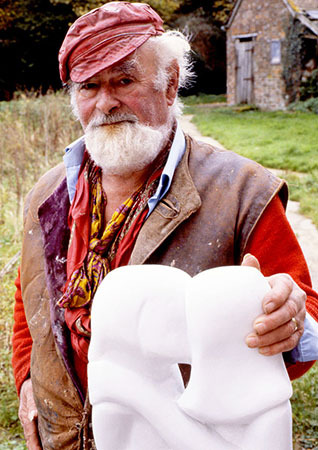 Following this meeting I often met Sven on the streets of Wimborne, dressed in his usual attire. He always had time for a quiet and gentlemanly word, certainly one of Wimborne’s well remembered characters. Sven died at the age of 88 in 1999.